On arrival at Delhi international airport our assistance will meet you and transfer you to the hotel. After refreshment visiting half day sightseeing of Delhi. Like Red fort, Jama mosque, Raj Ghat and chandani chowk. O/night stay at hotel. After breakfast check out from hotel and drive to sunderban check in the forest lodge. Pay a afternoon visit to the forest museum & watch different species residing in the mangrove world of the Sunderbans.back to lodge and overnight stay there. 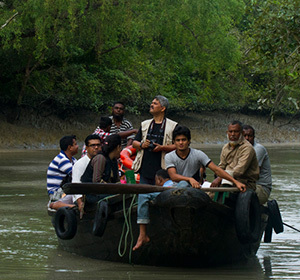 After breakfast visit the Sundarbans forest and enjoy a full day cruise by boat through the creeks of the dense forest. Visit Pakhiralya, Sudhanyakhali Watch Tower, Netidhopani Watch Tower & also other points of the Sundarbans forest. Overnight stay in forest lodge. Arrive at bhubneshwar.check in the hotel.afternoon take sightseeing of of bhubneshwar,which includes visit to parsurameshwarm temple,lingaraj temple and dhaulli.overnight stay in hotel. After breakfast check out from hotel and and drive to puri. you will reach there in afternoon.spend the time on the shores of beaches. back to hotel and overnight stay in hotel. After breakfast now its time to move on. Today you will visit the worlds famous temples including JAGANATH TEMPLE AND LOKNATH TEMPLE.back to the hotel and overnight stay there. After breakfast go for the full day sight seeing.later back to hotel and overnight stay there. After breakfast check out from hotel and drive to bhubneshwar and from bhubneshwar board a flight back to Delhi.